In less than 100 days, thousands of foreigners will visit our country for the biggest football event in the world. Let us welcome these visitors with open arms and make them feel at home. You can do this by saying: "Hallo, welcome to South Africa" in some of the different languages spoken by our visitors. You may not be able to pronounce all the words correctly, but at least they will know that you tried. So, let us teach you how. 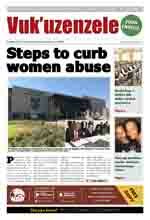 November last year marked a major highlight in the preparations for this year's FIFA World Cup. 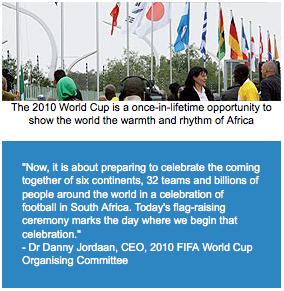 The 2010 Organising Committee welcomed participating countries to Africa's first FIFA World Cup with a symbolic flag-raising ceremony featuring all the participating countries' flags. Marking a highlight in African sporting history, South Africa as the 2010 World Cup host nation, joined the other 31 qualifying countries as the flags of all 32 participating teams were raised in celebration. The ambassadors and embassy representatives of the 32 countries raised their flags outside SAFA House in Johannesburg. This is just metres away from the Soccer City stadium where the opening match will be played on 11 June and the final match on 11 July. All the major countries in world football have qualified for the tournament, as well as a number of countries that may surprise football fans with their performances. "We congratulate all the teams that have now qualified for the 2010 FIFA World Cup. For us this is a very emotional day," said Dr Danny Jordaan, Chief Executive Officer of the 2010 FIFA World Cup Organising Committee, South Africa. "After all the years of hard work that have gone into preparing for this momentous event, it is now a reality," he said. "We're particularly delighted that the giants of African football, Cameroon, Nigeria, Ghana, Ivory Coast and Algeria, join hosts South Africa in what is a formidable line-up of African participants", Jordaan said. He added that it was no longer a case of asking whether the stadiums would be ready. "They are ready and they will be beautiful cathedrals, which will host the best footballers in the world." The final line-up of the countries who have qualified for the 2010 FIFA World Cup is: Nigeria, Cameroon, New Zealand, Japan, the Netherlands, Korean Republic, Korea DPR, Australia, the USA, Brazil, Ghana, England, Paraguay, Spain, Denmark, Ivory Coast, Chile, Germany, Italy, Mexico, Serbia, Switzerland, Argentina, Honduras, Slovakia, Algeria, Portugal, France, Slovenia, Greece, Uruguay and South Africa. Arabic is the official language of these people from northern Africa. To welcome visitors from these countries, say: "Assalamu-alaikum! or Marhaba!" Slovenian is the official language spoken in Slovenia. You can welcome them with: "Pozdravljeni, Dobrodosli v Juzno Afriko"
Spanish is spoken in these countries To welcome visitors from these countries, say: "Hola, Bienvenidos a Sudáfrica"
Portuguese is spoken in these countries. You can greet them by saying: "Ola, Bem-vindo a Africa do Sul"
People of Denmark speak Danish. This is how you say "Hello, welcome to South Africa" in Danish: "Hej, Velkommen til Sydafrika"
French is spoken by people who live in these countries. You can greet them by saying: "Bonjour, Bienvenue en Afrique du Sud." You can welcome people from these countries in German. Welcome them by saying: "Hallo, willkommen in Südafrika"
Greek is the language spoken by the people of Greece. You can greet them by saying: "Geia sas, Kalos Ilthate stin Notio Afriki"
Italian is spoken by the people of Italy. Welcome the Italians by saying: "Ciao, bevenuto in Sud Africa"
Japanese is the official language of Japan. Welcome the Japanese by saying: "Kon'nichiwa, yokoso minamiafurika kyowa koku"
Both of these countries speak Korean. Welcome the Korean people by saying: "Annyeonghaseyo, nam-a peulika gonghwaguge osin geos-eul hwan-yeonghabnida"
The Netherlands: Dutch is the language spoken in the Netherlands. Welcome them by saying: "Hallo, Welkom bij Zuid-Afrika." Serbian is the official language of this country. Welcome visitors from these countries with: "Poštovani, Dobrodošli u JužnoJ Africi." The Slovakian people speak Slovak. Greet them with a simple: "Dobrý deň, vitajte v Južnej Afrike."